The catalog records 11,690 entries by mid-August 2014. Lately some improvements are taking place in the database, particularly in the spatial area. Thanks to the assistance of geographer José Antonio Cezón, lots of countries are being checked to enter proper data on their territorial divisions (provinces, counties, cantons, regions, etc.) With this operation, case locations are accurately described, and regional codes are being included to allow suitable geography and population studies. Local assistance has been kindly received for Denmark by colleague Ole Henningsen. *Vicente-Juan Ballester Olmos and Andrés Duarte, “A Weird Spacecraft”, UFO Today, No 2, February 2014, pages 14-17. 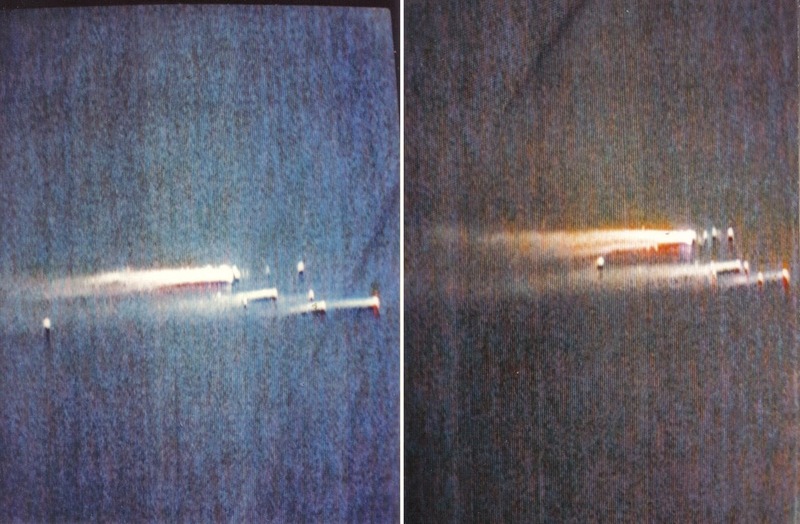 The object changed to a very bright white color and then to a dull gray, descending like a falling paper until it was placed at about 150 or 200 m above the boat. Fear pervaded the three witnesses and Mr. Álamo tried to speed up the engines unsuccessfully…these just got intermittent…as well as the signal lights of the boat...in vain he tried to communicate by radio, the published story continues. It was then that Mr. Álamo took a flashlight and pointed at the object, which, as if responding to the signal, began swaying. The witness could calculate a diameter of 75 feet (23 meters) to the object. It then threw out a ray of light from a couple of square lanterns that were on the ends of the craft ... after a few seconds , these were retracted and returned back to the saucer, as if it was a tube of light. The situation on board was so dramatic that they had to prevent the sailor from throwing himself to the water, while Mrs. Álamo tied her wedding ring to one of the fishing rods, should the worst happen. The object was changing colors, leaving a green trail, moving vertically until it was seen no more with the light of dawn. Let us admit it: this is an extraordinary case. Three observers, three reliable witnesses, a UFO that produces electromagnetic effects and responds to signals from the witnesses. Its shape, size and maneuvers are unrelated to any conventional aircraft. It was at a short distance from the observers, who were irradiated with a retractable light beam, undoubtedly an anomaly of physics. What else rabid UFO debunkers need to blindly believe, finally? But it has not been necessary to go to the Dominican Republic, not even to talk with witnesses on the spot. From our laptop, contacting via the Internet with databases held by NASA, by the Air Force Cambridge Research Laboratory (AFCRL) and by experts in space information, this amazing event can be solved. (http://ntrs.nasa.gov/archive/nasa/casi.ntrs.nasa.gov/19810005401.pdf), it indicates time "09:10:44 UT," as the actual release of barium in the atmosphere. 9 a.m. UT corresponds to 4 a.m. (local time) in the Dominican Republic. It was a project code-named Dogwood, one conducted under the campaign they called Secede. The listing of suborbital launches by Dr. Jonathan McDowell, a recognized expert from Harvard University (http://planet4589.org/space/lvdb/lis/S.lis) was also consulted. It records the launch of a rocket from the Puerto Rican base at 05:06 UT. The same information appears in the records of The Encyclopedia Astronautica (http://www.astronautix.com/thisday/may13.htm), as it takes data from the McDowell database. In correspondence with this specialist, he confirmed an error in his listing. After checking his source (report "AFCRL memo AFGL-TR-78-012, Special Reports No. 213") he found out that the recorded launch time was "05:06L", this is 5:06 a.m. Puerto Rico local time (AST), or 4:06 a.m. local time in the Dominican Republic, or 09:06 UT. Discrepancy resolved. 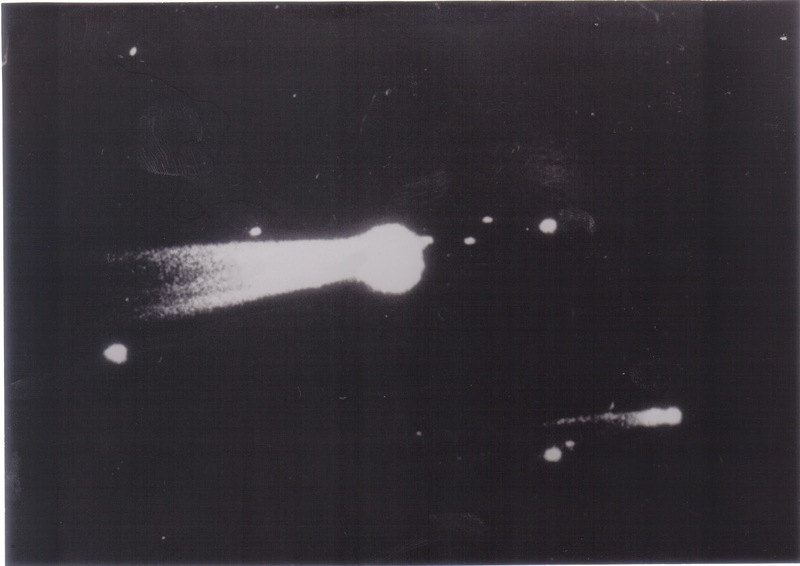 The discharge of a load of barium at ~200 km of height generated that early morning of May 13, 1968, a bright cloud of about 100 km extent, which, seen from the boat of Mr. Álamo, produced the sighting described above. In this context, it is very important to realize the actual distance and size of the phenomenon, compared with the erroneous assessments given by the witnesses. By the way, such emissions in the atmosphere, excited by solar radiation, generate visible-light, but not other types of electromagnetic fields. Now that we know the solution of the sighting we should reflect on how the events are misinterpreted, embellished, and colored by eyewitness, who even invent details when narrating their UFO experiences. Will the lesson be learned once and for all? I bet not. I knew the first reference to this occurrence in MUFON’s journal Skylook of June 1973, pages 7-8: “Richard Coimbra and Curt Huettner, both 15, Thousand Oaks, California, were filming a movie for a class on February 8, 1973. Using still photography the youths had mounted the wording for a title shot on a piece of glass and were shooting skyward to catch the effects of the clouds. They took a picture of an object which they estimated to be perhaps 800 feet (244 m) in the air and one half to three quarters of a mile away (~800-1200 m) from their site. 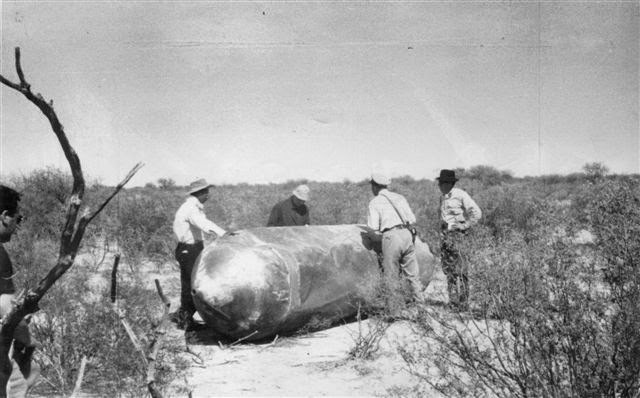 Curt thought the object might be 70 feet (21 m) in diameter. It was silent. There was no hum, flame or smoke and it looked to be rotating. We saw it for about 30 seconds then it went behind the trees and clouds and out of view. Curt, who is interested in the space program, thinks the object could be some kind of Government experiment. Richard, who says both his father and his grandfather have seen UFOs, thinks intelligent life from some galaxy may have been piloting “the aircraft.” The source of this story was a March 20th, 1973 clipping from the Thousand Oaks “News-Chronicle,” where the picture was first published. 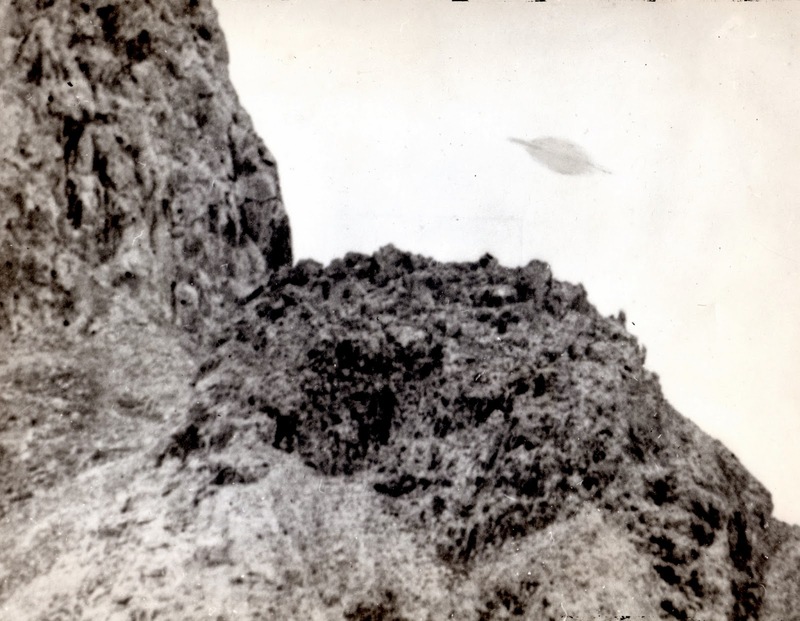 The Conejo, California UFO photograph has appeared in print in UFO journals and books, and no one doubted its authenticity (with the exception of the US investigator Larry Robinson, for whom it was a fake, an object thrown to the air.) Recently I was given a reproduction copy from the original photograph (thanks to Patrick Ferryn, who handed over me the photographic files of Lucien Clerebaut, of SOBEPS fame), I hurried to ask FOTOCAT Project’s consultant Andrés Duarte to study the print. His following analysis report is self-explanatory. It reveals a hoax. Sometimes it is possible to estimate the distance and size of an object in a photo from the magnitude of its defocus blur, thanks to the defined relationship existing between focusing and distance. The defocus blur can be quantified by modeling it and fitting the model to the image’s Fourier spectrum, or to its gradient distribution, or to the PSF (point-spread function) obtained through restoration. The fitting can be done with optimization or learning techniques. The articles listed at the end , detail some specific methods and explain the concepts mentioned in this paragraph. In the Conejo photograph, it is not easy to make a reliable estimate of the defocus blur due to the excessive granulation and because the image is motion blurred in addition to being out of focus, so that in this case the measurement was made on several copies of the picture and through various defocus estimation methods, then averaging the various results obtained. In order not to confuse the defocus blur effect with the motion blur effect, the evaluation of results should be done in the perpendicular direction to the movement, where there is only defocusing. The above figure shows, on the left, the original image of the object in one of the copies. On the right, the photo is partially degranulated by an adaptive filter and the focusing is restored by deconvolution. The deconvolution can be used to completely restore the sharpness of a photo, but in this case we only need to restore the focusing in order to distinguish the defocus blur from the motion blur effect. With a naked eye it is possible to notice in both images that the object’s boundaries are more blurred in the direction of movement (red arrows) and sharper in the direction perpendicular to the motion (green arrows). But this difference is better seen in the restored picture (on the right), since the focusing has been restored but not the motion blur. The defocus blur, as measured by the different methods used, ranges between 0.18 and 0.21 mm (0.195 mm on average) in the image of the tree, and between 0.12 and 0.15 mm (0.135 mm on average) in the image of the object. It is expressed as the diameter of the circle of confusion "c" . If the tree was about D = 30 m away, then we can find the value of S in the equation by knowing that its image has a value of c = 0.195 mm. The result is S = 5.9 m, and this value should not have a major error bar in spite of the fact that the distance to the tree is not very accurate, because the formula is little sensitive to error at large distances. Knowing now the value of S and knowing that the object has a defocus blur c = 0.135 mm, we can solve for the actual distance D to the object. In this case we have two solutions: D = 3.8 and 13 m, because there are two planes with the same defocus blur, one in front of the focus point and another behind it. The ratio between the size of the object image in the film (which is 2 mm) and the focal length (f = 114 mm) is equal to the ratio between the object size and the distance of the object to the camera D, so that the object actually measures D * (2 mm / 114 mm) = 7 or 23 cm. It is unlikely to know with certainty which of the two solutions is the correct one, but in either case, the small size of the object and the presence of motion blur in its image are consistent with a hoax carried out with a small disk thrown to the air. The circle of confusion can be considered as a measure of the defocus blur, but should not be confused with the permissible circle of confusion, often abbreviated incorrectly as "circle of confusion" in the photographic literature. 1954 is a well-known year in ufology because of its major UFO wave. 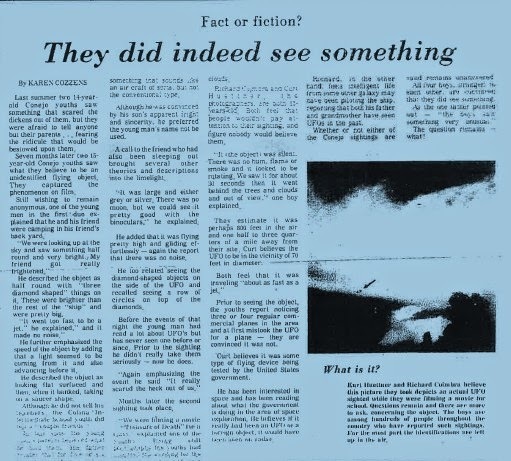 Since I published the paper “The Year 1954 in Photos (Expanded)” in 2008 (http://www.box.net/shared/y1mufymo8w), several new cases have appeared, but 1954 still yields new UFO reports of the photographic kind, when old newspaper collections are reviewed, for example: August 9, 1954 at Saint John, New Brunswick (Canada), as per an article printed in the Guardian of the Gulf (Charlottetown) on the following day. Press reported that a round, white flying object with a “Y” marking on its face was observed from 7 p.m. to sunset (for over 45 minutes.) Two photographers successfully took a series of pictures, “showing the object in varying sizes.” I feel it probably was a hydrogen-filled balloon. The cover of the Dixon Evening Telegraph, a newspaper published in Illinois, carried on its cover of May 11, 1954 some notes from the Editor’s daybook reporting that at 6:15 a.m. he was awaked by a call from Sgt. 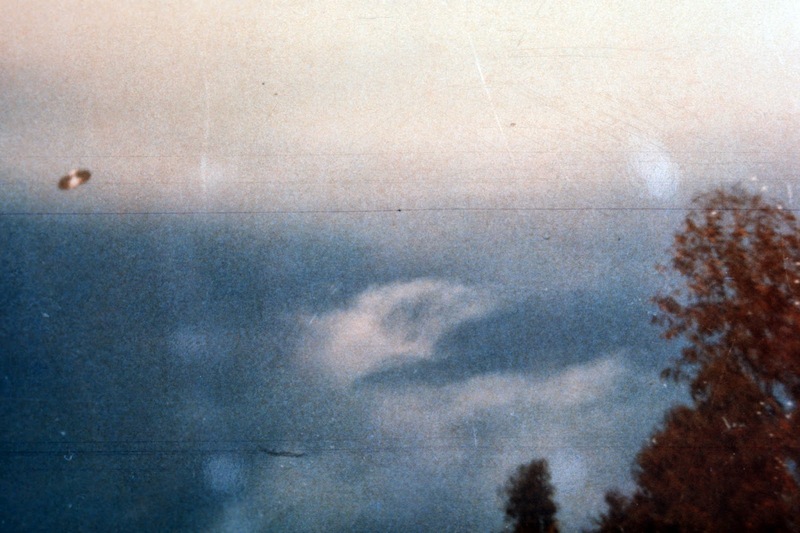 Jack Van Meter who informed him of a “weather balloon that looked like a flying saucer.” That morning many citizens were scanning the skies to view the apparition. Later on, the sheriff’s office had a report of a second balloon, this time it was photographed: “it registered as a speck on the film,” Chief-Deputy Bob Burrs said. This time from Belgium: La Docherie, Marchienne-au-Pont, Hainaut, Belgium, October 26, 1954. At 4 p.m. and for over 14 minutes, a second sun was observed by many people. It was even filmed. Investigation has disclosed it was an optical, atmospheric phenomenon called sun dog or mock sun (a parhelion.) The initial news was published in the local newspaper, Le Journal de Charleroi of October 27, 1954. As the clipping I have has a poor quality, I am taking advantage of this opportunity to request a better copy of it from any Belgian reader who can get a direct photocopy or scan from this edition. Back to the US, on September 26th, around 8 p.m. a “multi-colored cylinder” was observed from South Wayne (Wisconsin), a sight repeated on the following day in the lower southeast sky, “seemingly below the other stars” that kept “bobbling around” throwing off red, green, blue and yellow light at intervals until it faded. 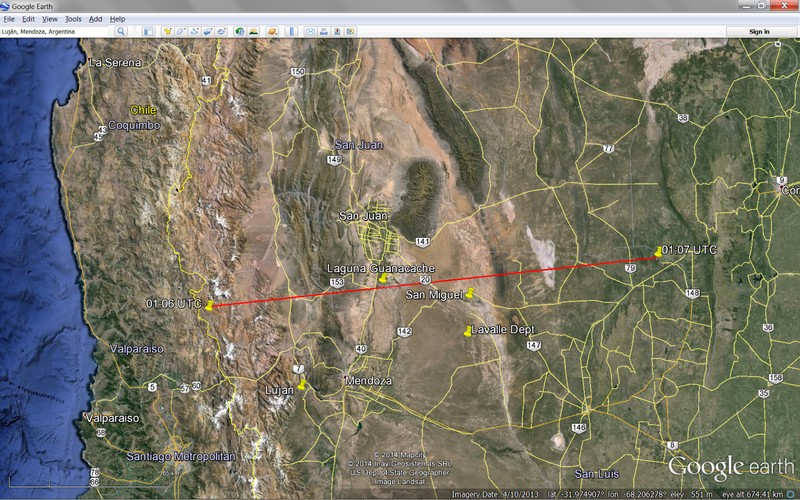 Venus was prominent at that time in the southwest, however. Was the published direction a newspaper misprint? 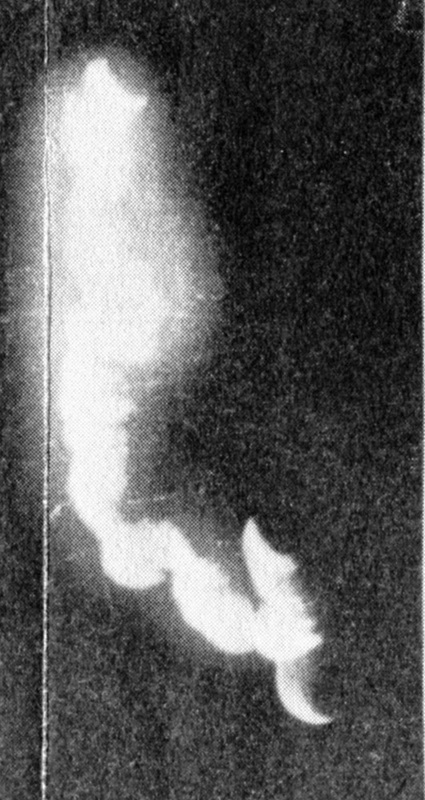 One of the first examples ever reported of an “angel hair” fall and probably the first to be filmed happened on Monee, Illinois, during the week October 18-24, 1954, as reported by the Chicago’s Star Publications of October 22 and 26, 1954. Angel hair is just gossamer, spider silk; when millions of tiny spiders drop this in the air and as it flies, it keeps bumping into other strands of the same stuff and pretty soon there’s a big clump of it flying by. This explains why villagers were deluged with fleecy strands of this substance, not mysterious anymore. Also to be noted, numerous newspaper clippings from the 1954 US press disclosed an intense balloon activity from September to December. From local military sources, the US Weather Bureau, the Air Force Research Center (Cambridge, Massachusetts), USAF at Vernalis, California, Holloman Air Development Center, etc., the skies all over the United States were filled with those floating devices (some falling wrecked to the ground, where they were recovered) creating a stir among the population, who took them for flying saucers. Abstract: Mankind's anthropocentric view of itself impedes our ability to take an open-minded view of our uniqueness or lack thereof in the universe. Technological advances in astronomy have begun to tear away at the uniqueness of Earth. The question to entertain is the likelihood of intelligent life in the universe. 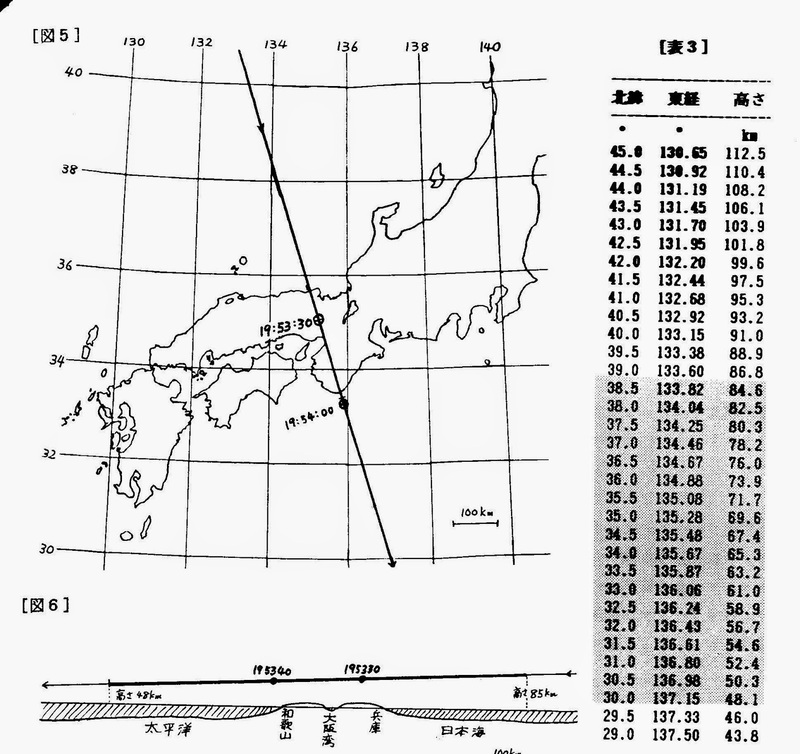 At 10:53Z on October 8, 1985 the sky fell apart over Japan. The local time was 7:53 p.m., when the propelling rocket of the Russian satellite Cosmos 1685 (international designation 1985-085B, catalog number 16089) tumbled down to Earth in a fiery re-entry that was sighted by lots of citizens. We all are familiar with Japanese tourists with their ubiquitous hand-held cameras. It is not unexpected that this evening’s amazing luminous event produced also lots of photographic evidence, for the satisfaction of astronomers and space scientists. The rocket booster was seen disintegrating in a descending path from 85 to 40 km of height with a speed of 6.8 km/sec during a few minutes. Time enough to be captured on film (both video and still photography) by several observers from many locations. I thought that a display of images from this space decay would interest this blog’s readers. From top to bottom: track scheme of decay and pictures taken in Osaka (frames from video), Aki (Syoji Maeda), Osaka (Mitsuru Yamagishi), and Fukuyama (Eiji Nojima). 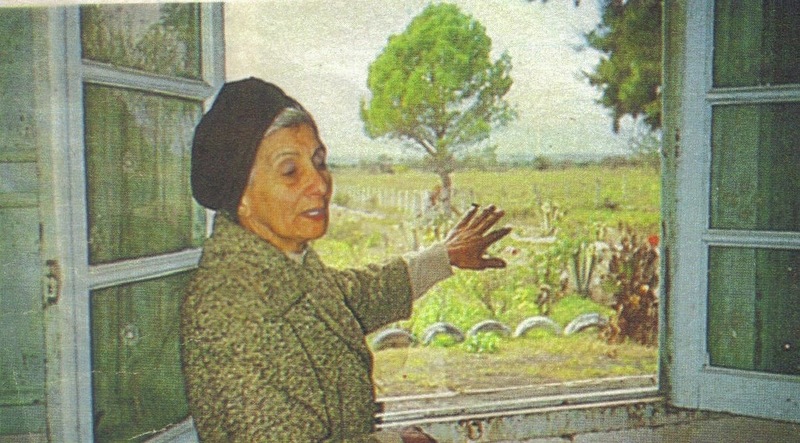 One of the most noteworthy UFO landing reports in Argentina is the Trancas, Tucumán case of October 21, 1963, an event that took place between 9:30 and 10:15 p.m. when several witnesses from the Moreno family, three sisters 24 to 30 years old, their parents, and a servant of 15 years, saw an illuminated train-shaped object, 8-10 m in length with portholes, some 250 m away from their home, hovering in the air. Within the object, several “persons” were sighted moving along. 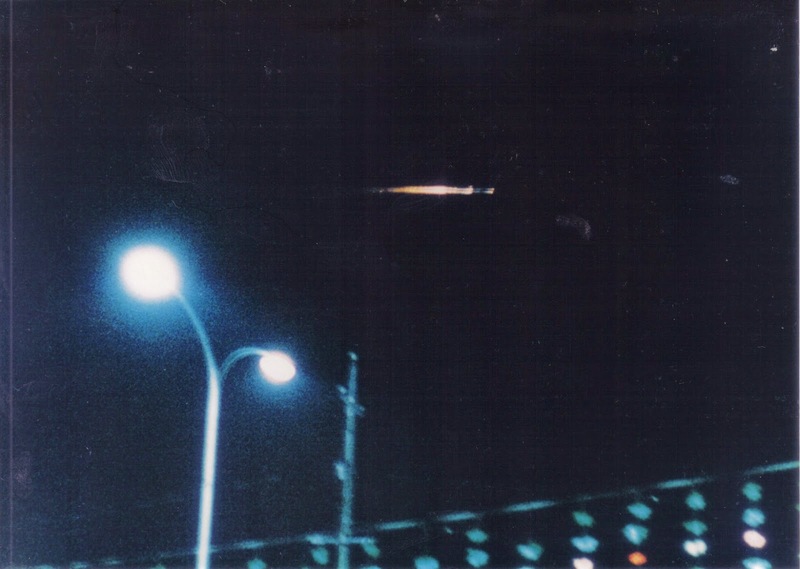 A powerful ray of light was emitted from the UFO, blinding the witnesses. Captain Omar Pagani, of the Argentine Navy, charged with the study of UFO reports, investigated the incident. Years later, he sent me a copy of the official UFO questionnaire and some correspondence Captain Pagani exchanged with one of the witnesses. My purpose here is to share with you this never-published information as a pdf file. (It is in Spanish.) Also attached is a photograph of witness Yolanda Moreno, 28 years after the sighting: in the background, the alleged landing site. This sighting has been thoroughly investigated by two of the foremost UFO researchers in Argentina, social-psychologist Roberto E. Banchs and lawyer Oscar Galíndez. Both respected, close friends of mine but holding opposite conclusions (military exercises for Banchs, a true UFO landing for Galíndez.) 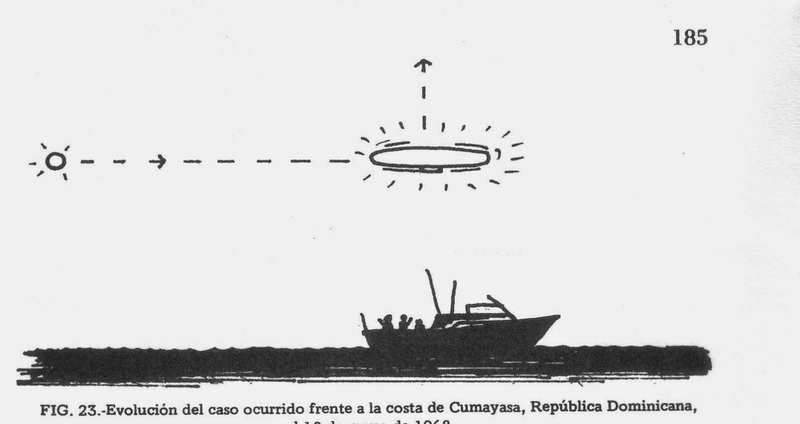 Together with the disclosure of the Argentine Navy’s UFO form, I am also citing online references to the two conflicting reports (in Spanish) so that readers can have both views and make their own inferences. From there we quote: “Transient luminous phenomena’s [sic] has been observed in the low atmosphere over the Hessdalen valley, Norway, for over 200 years. The first written documentation dates back to 1811 when the priest Jakob Tode Krogh wrote about it in his diary.” But Norwegian UFO researcher Ole Jonny Braenne remarks: “That is just plain wrong, and Hauge & Strand should know better. The 1811 “report” was the C/1811 F1 comet, seen worldwide, not just in Hessdalen. And the priest Jakob Tode Krogh, he didn’t even write a diary. It does not exist. So they are referring to a non-existing source. The pristine reference is from a book by Reitan, Bygdabok for Ålen (1934), page 314, where priest Krogh is mentioned in a single sentence there, and the very next sentence mentions the 1811 sighting of a star with big brushwoods was seen in the sky. Reitan is quoting from a diary by Lars Dybdalen, giving details of many local social events during the years 1806-1824. Someone has misunderstood the context." 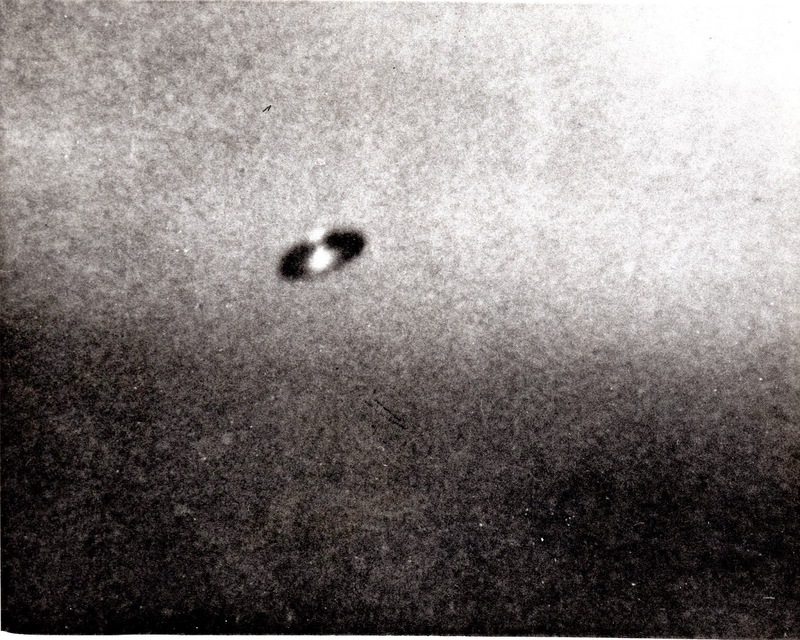 A Brazilian UFO journal (SBEDV Bulletin of April 1968) published a barely 4-line entry on a picture taken in Bell City (Buenos Aires, Argentina) on the night of September 15, 1967 by an Argentine citizen named Alfonso R. Paolocá. The camera was a Voigtländer of 35mm, with a green filter and 2-3 minute time exposure. At first sight I thought of a crescent moon repeated in several positions, like when you do a manual time-exposure snapshot. The Bulletin received the picture from a UFO aficionado from Argentina and if the name was partially wrong and incomplete (actually Hipólito Rodolfo Paolocá), I am afraid the date could also not be accurate. If we see the crescent lunar phase one week before, exactly on September 8th, at 8 p.m. Buenos Aires time, one is tempted to see an association between the alleged UFO and the visual shape of the Moon that day. Below: the photograph and the lunar phase. The FOTOCAT’s database rang a bell when this case was recently entered. The catalog had another case in Bell City before. 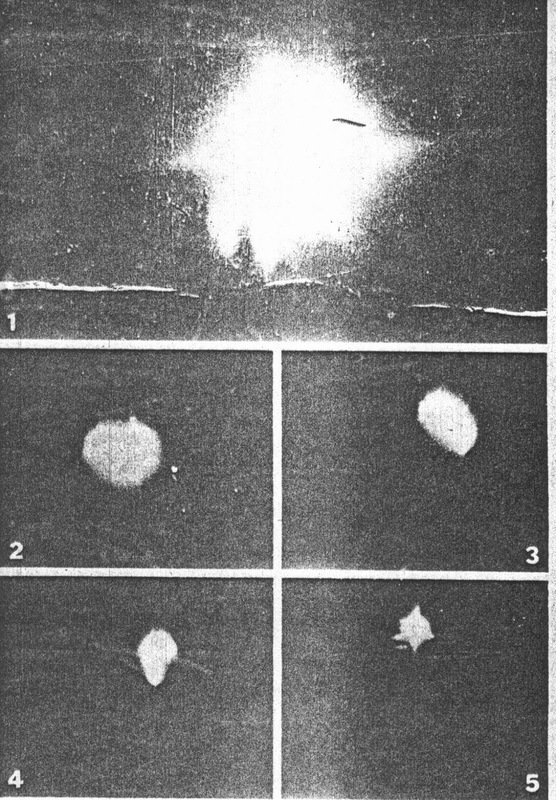 Yes, it was a series of 5 photographs taken at around 9:15 p.m. on the clear night of May 22, 1962 by…Hipólito Rodolfo Paolocá, an ufologist at the time and an amateur photographer. Do you know how many other eye-witnesses were in this massively populated suburb of Buenos Aires? Zero. Just himself. In that time frame, the Moon was visible, rising over the East horizon. This is my best option as the real culprit for these images. Below: the set of 5 photos and the corresponding lunar phase. Recently, Dr. Fernandez has published a very erudite monograph that reviews the sightings of the so-called airship wave of 1896 and 1897, in the light of the socio-cultural framework of the time. A highly recommended piece of work. In addition to experienced UFO researchers, I know that novice and aspiring UFO-investigators also read this blog. This is especially for them. The Center for UFO Studies (CUFOS)’s Center Investigators Quarterly, No 1, June 1977, presented a standard procedure for writing a UFO sighting report, a very neat, clear format that helps the investigator both to document any observation and to conduct an on-site UFO inquiry. I am enclosing this procedure as a helpful tool. A short but minutely-documented review of MJ12 is to be found in an article just published by ex-CUFOS director of special investigations Don Schmitt. Do you remember the Majestic 12 forged UFO documents? The result of that story was that US ufology froze and lost at least 10 years, 1979-1989. Albeit centered on the colorful character of William Moore, in fact everything is rooted in the tortured personality of an individual with the humble rank of Sergeant named Richard C. Doty, working in the Air Force Office of Scientific Information (AFOSI), then stationed at Kirtland AFB, Albuquerque, New Mexico. Doty created numerous false documents pretending to prove that the US Government had developed a covert, super-secret operation with the cypher name of Majestic 12, based on the recovery of flying saucer pieces and pilots since 1947. In my personal assessment, most–if not all–that Doty did was the product of his own malicious, sick mind, aired and multiplied by the belief or interest of gullible and opportunist ufologists. The fable of official UFO secrecy is belied once more…now in Italy. A couple of journalists just addressed themselves to the Italian Air Force (Aeronautica Militare): “Hey, can we look at the classified UFO archives?” they asked. “Yes, please, be our guests,” was the reply. Sort of. The fact is that Lao Petrilli and Vincenzo Sinapi were granted full access to consult all the official UFO records in the custody of the Italian Air Force. They have released their findings in a book. 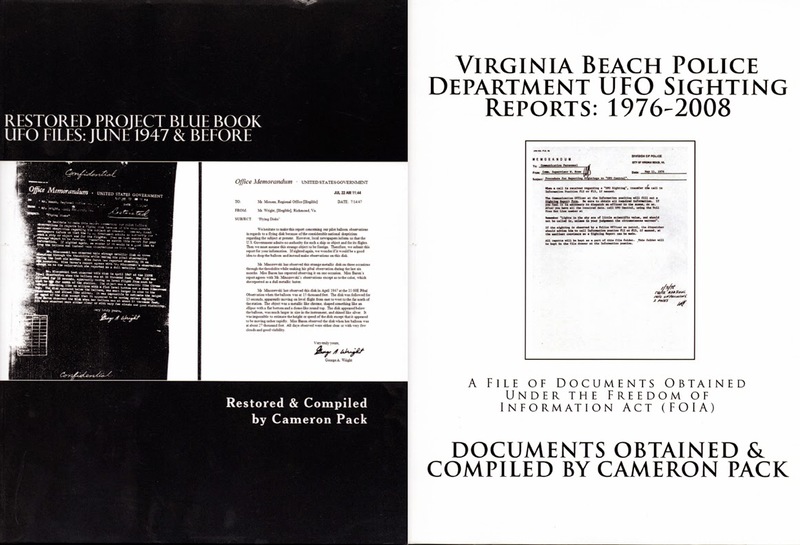 Since 1972, the Armed Forces started to collect, catalogue and investigate UFO reports in an “organic mode” (though other agencies were concerned with the UFO phenomenon since 1950, a preoccupation boosted by the 1954 flap, quite intense in Italy) and the authors devote the first 30 pages to an informative expose of the Government-sided handling of UFO reports down the years. A historical note is pertinent at this regard: from 1991 to 2001, most UFO reports logged at the Italian Air Force headquarters corresponding to the period 1979-1990, were declassified and released to CISU, a major Italian UFO organization. The beach town of Jávea (Alicante) was the scene where Patrick Ferryn, past officer of Brussels UFO organization SOBEPS, currently founder of COBEPS, certainly a distinguished figure in UFO research in Belgium, and I decided to meet last May 27th, taking advantage of a sunny Spanish vacation. With us, my close coworker, Jaime Servera. In a very relaxed and friendly atmosphere, we covered a number of topics of common interest, mainly my present study with Wim van Utrecht of Belgian UFO photographs and the big UFO wave in Belgium 1989-1992. Patrick donated to FOTOCAT lots of original photographs from the files of Julien Clerebaut (SOBEPS alma mater), including first-generation prints of the January 16, 1958 Trindade Island, Brazil fly-by case and the October 1973 Falkville, Alabama humanoid case. This encounter between colleagues has served to even reinforce an already stable cooperation between the two parties. In the picture that follows, Ferryn (left) and Ballester Olmos. Close-up of Trindade Island picture #3 made by photographer and witness Almiro Baraúna himself. Consultant Andrés Duarte has detected that this blow-up has been hand-retouched. See a couple more Personal Log items at the bottom of the Spanish section of this blog. • Deliver sighting reports, photographs, archives, bibliography, etc. A mitad del mes de agosto de 2014, el catálogo reúne la cifra de 11.690 casos. Últimamente se están dando pasos para mejorar la base de datos en el apartado espacial de los avistamientos. Gracias a la notable ayuda del geógrafo José Antonio Cezón, muchos países se están revisando para registrar y completar datos relativos a sus divisiones territoriales (provincias, regiones, estados, cantones, condados, etc.) Con estas acciones, las localizaciones de los casos quedan más exactamente descritas y sumamos códigos regionales a las correspondientes columnas de datos, lo que permitirá en su día estudios geográficos, poblacionales y otros. Al respecto, agradezco la ayuda prestada por Ole Henningsen con los casos de Dinamarca. *Vicente-Juan Ballester Olmos y Andrés Duarte, “A Weird Spacecraft”, UFO Today, número 2, febrero de 2014, páginas 14-17. Sebastián Robiu Lamarche es uno de los ufólogos caribeños más importantes y su obra Manifiesto OVNI de Puerto Rico, Santo Domingo y Cuba (Punto y Coma, San Juan, Puerto Rico, 1979) uno de los mejores libros latinoamericanos. Recientemente revisé los casos fotográficos allí publicados para su registro en la base de datos FOTOCAT y encontré uno especialmente significativo en las páginas 184-186. El fenómeno comenzó hacia las 4 de la mañana del 13 de mayo de 1968 y desapareció al amanecer; los hechos ocurrieron en La Boca de Cumayasa, cerca de San Pedro de Macorís (República Dominicana). Como el orto solar ocurrió en el lugar de observación a las 05,05 horas, deducimos una duración de aproximadamente una hora para el avistamiento. Todo sucedió a bordo de un bote mientras practicaban pesca deportiva el industrial Isidro Álamo, su esposa y un marinero. En resumen, a unos 30º de elevación desde la popa vieron un objeto “redondo, de color amarillo”, del tamaño de la luna llena (también visible aquella noche clara). El objeto se tornó rojizo mientras parecía acercarse rápidamente, y en unos pocos segundos el ovni cubrió la milla náutica [1.832 m] que le separaba del bote, colocándose sobre la lancha, a unos 300 metros verticales, según apreció el señor Álamo (ver la figura siguiente). El objeto cambió a un blanco muy brillante y luego a un gris opaco, descendiendo como un papel cayendo hasta colocarse a unos 150 o 200 metros sobre el bote. El temor invade a los tres testigos y el señor Álamo intenta acelerar los motores sin que éstos respondieran…se pusieron intermitentes…igual las luces de señales de la lancha…en vano ha tratado de comunicarse por el radioteléfono, sigue la historia publicada. Fue entonces cuando el señor Álamo toma una linterna de mano y apunta hacia el objeto, que, como respondiendo a la señal, se inclinó bamboleándose. El testigo puede calcularle un diámetro de 75 pies [23 metros]. El objeto lanza un rayo de luz por un par de faroles cuadrados que estaban en los extremos de la nave…al cabo de unos segundos, éstos se recogieron hacia atrás y volvieron al platillo, como si se tratara de un tubo de luz. La situación a bordo fue tan dramática que tuvieron que impedir que el marinero se arrojara al agua, mientras la señora Álamo ató su anillo de boda a una de las cañas de pescar, en caso de que sucediera lo peor. El objeto fue cambiando de colores, dejando una estela verde, moviéndose en vertical, etc., hasta que dejó de verse con las luces del alba. Sin duda, el caso es extraordinario. Tres observadores, testigos fiables, un ovni que produce efectos electromagnéticos y que responde a las señales de los testigos. Forma, tamaño y maniobras nada comunes para un aparato convencional. A muy corta distancia de los observadores, a los que irradió con un haz luminoso retráctil, ciertamente una anomalía física. ¿Qué más necesitan los rabiosos desacreditadores del fenómeno ovni para terminar de creer a pies juntillas? Pero no ha hecho falta ir a la República Dominicana tocados en plan explorador de pacotilla, ni siquiera hablar con los testigos in situ, haciéndose con ellos las fotos de rigor. Desde nuestro ordenador portátil, contactando vía internet con las bases de datos de la NASA, del Air Force Cambridge Research Laboratory (AFCRL) y de los expertos en información espacial, se ha logrado resolver este asombroso suceso. Años de estudios de casos nos han permitido intuir, en esta ocasión, que podría tratarse de una prueba espacial. Nuestro consultor Manuel Borraz ha examinado los datos del suceso desde esta perspectiva. En la página 13 del informe “AFCRL Space Science Research During 1968" (http://tinyurl.com/meo5fa8), se hace referencia a los experimentos de liberación de cargas de bario desde cohetes lanzados desde Vega Baja (Puerto Rico) en el mes de mayo de 1968. Pues bien, en la Tabla A1 del Apéndice A de dicho informe, se indican las 09,08 horas (UT) para la prueba del día 13 de mayo (lanzamiento del proyectil). En (http://ntrs.nasa.gov/archive/nasa/casi.ntrs.nasa.gov/19810005401.pdf), un informe elaborado por la NASA (tabla B-3 del Apéndice B) se indica las "09,10,44 UT", en referencia al momento exacto de liberación de bario en la atmósfera. Las 9 horas de tiempo universal (UT) coinciden con las 4 (hora local) de la República Dominicana. Se trató de un proyecto llamado Dogwood realizado en el marco de la campaña denominada Secede. (http://planet4589.org/space/lvdb/lis/S.lis) en donde se registra el lanzamiento de un cohete desde la base puertorriqueña a las 05,06 UT. Lo mismo hace la Encyclopedia Astronautica (http://www.astronautix.com/thisday/may13.htm), que sacó la información de la base de datos del Dr. McDowell. En correspondencia con este especialista, me confirmó un error en su listado. Verificando su fuente (el informe “AFCRL memo AFGL-TR-78-012, Special Reports No. 213”), comprobó que la hora consignada para el lanzamiento del cohete fue “0506L”, o sea 05,06 hora local de Puerto Rico (AST). Que son las 04,06 en la República Dominicana y las 09,06 UT. Discrepancia solventada. La emisión de una carga de bario a más de 200 km de altura produjo aquella madrugada del 13 de mayo de 1968 una nube luminosa de unos 100 km de envergadura, que, vista desde el bote del señor Álamo, produjo la observación que describimos al principio. Es importante darse cuenta de las distancias y tamaños reales del fenómeno, comparados con las erróneas apreciaciones de los testigos. Por cierto, tales emisiones en la atmósfera generan luz visible ‒al ser excitadas por la radiación solar‒ pero no otros tipos de campos electromagnéticos. Ahora que conocemos la solución del avistamiento debemos reflexionar sobre cómo los testigos de sucesos reales interpretan, embellecen, colorean y hasta inventan detalles al narrar sus experiencias ovni. Pero, ¿aprenderán de una vez por todas los que tienen que aprender? Apuesto que no. (Nuestro agradecimiento a José Antonio Cezón Alonso, Manuel Borraz Aymerich y Dr. Jonathan McDowell). Supe de este caso por vez primera leyendo el boletín del MUFON Skylook de junio de 1973, páginas 7-8: “El 8 de febrero de 1973, Richard Coimbra y Curt Huettner, los dos de 15 años, del pueblo de Thousand Oaks, California, estaban filmando una película para un ejercicio de clase. Los jóvenes habían montado la redacción del título que iban a fotografiar en un trozo de cristal y estaban disparando en dirección al cielo para capturar el efecto de las nubes. Sacaron una foto de un objeto que estimaron estaría a unos 800 pies (244 m) en el aire y a media o tres cuartos de milla de distancia (~800-1200 m) de donde se encontraban. Curt pensó que el objeto podría medir unos 70 pies (21 m) de diámetro. Era silencioso. No había zumbido, llamas o humo y parecía girar sobre sí mismo. 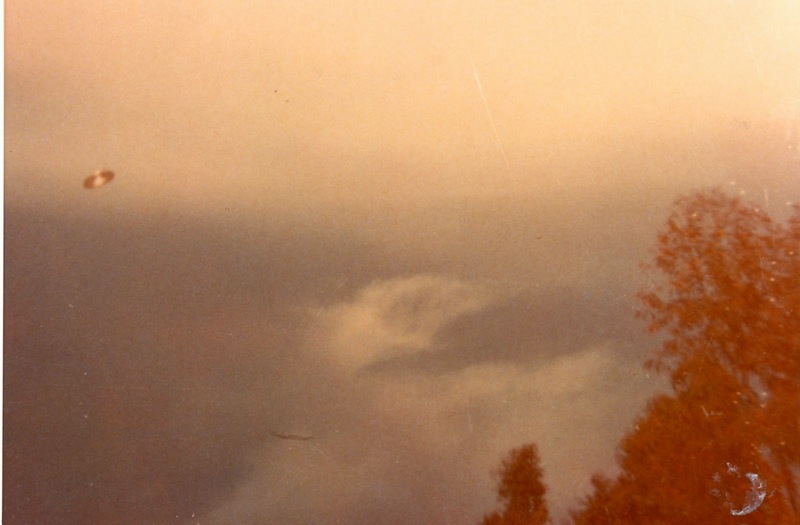 Lo vimos durante unos 30 segundos y entonces se fue detrás de los árboles y las nubes y lo perdimos de vista. Curt, que se interesa por el programa espacial, cree que el objeto podría ser algún tipo de experimento del Gobierno. Richard, cuyo padre y abuelo han visto ovnis, piensa que vida inteligente de alguna galaxia puede estar pilotando “la aeronave”. La fuente original de este relato fue un recorte del 20 de marzo de 1973 del diario News-Chronicle, de Thousand Oaks, donde primero se publicó la foto. A partir de la información de prensa inicial, más una entrevista al joven Curt por parte de R.F. Bowker, director del MUFON de California, y tras solicitar asesoramiento a Adrian Vance (editor de la costa oeste de la revista Popular Photography y uno de los analistas fotográficos del Ground Saucer Watch), se publicó un informe más extenso en la edición de mayo de 1974 de Skylook (tapa y páginas 6 y 7). Es en este artículo donde se informa que la hora fue las 4,45 de la tarde y que se usó una cámara Polaroid “Square Shooter”. Se considera la más importante aportación de Adrian Vance a la ufología su libro UFOs, the Eye and the Camera (Barlemir House, 1977), pero la reseña de esta obra escrita por Douglass Johnson en el The APRO Bulletin, que no es precisamente una revista escéptica, resume su contenido como “una mezcolanza de desinformación, casos recalentados y especulación sin fundamento”. Pues bien, Vance describe al ovni de la manera siguiente: “…un disco con cúpula, ligeramente inclinado, con una luz brillante que emana de un portillo en la parte inferior de la nave. El examen de la copia muestra que la imagen mide exactamente 2 mm de ancho. Como la distancia focal de la cámara es de 114 mm, podemos usar el ratio 2/114 para deducir el diámetro del ovni, siempre que sepamos la distancia al objeto”. Como el árbol que aparece al fondo estaba a 96 pies (29 m) de la cámara, la calidad de la imagen le permite a Vance concluir que el objeto estaba “a más de 1000 pies (~300 m) de distancia y probablemente entre los 2000 y 3000 pies (~600 a 900 m), citados por los jóvenes”. Considerando las distancias de 1000, 2000 y 3000 pies, Vance estima el diámetro real del disco en 18, 36 o 54 pies (5.5, 11 o 16.5 m), respectivamente. 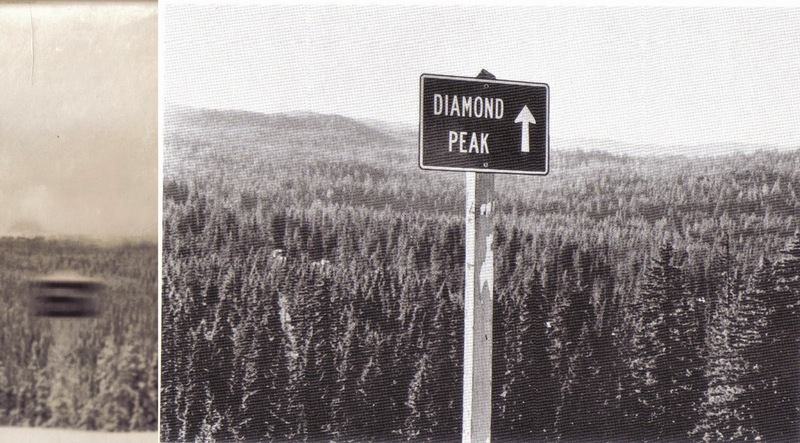 Además de otros cálculos como el grado de inclinación del objeto (14º), Vance establece una comparación positiva con una foto “similar” tomada en Oregón el 22 de noviembre de 1966. La competencia del autor que escribe que “ambas naves tienen posiblemente el mismo tamaño y verdaderamente la misma forma”, queda de manifiesto cuando recordamos que la fotografía de Oregón es sencillamente el resultado de una señal de tráfico borrosa debido a que se tomó la instantánea desde un coche en movimiento, y que posteriormente se adornó con un falso relato de avistamiento ovni (Irwin Wieder, Journal of Scientific Exploration, volumen 7, número 2, verano de 1993, páginas 173 a 198). Véase seguidamente la supuesta foto ovni (a la izquierda) y la señal de carretera que provocó la curiosa imagen (derecha). Esta fotografía se ha publicado repetidamente en revistas especializadas y libros y nadie ha dudado de su autenticidad (con la notable excepción del investigador norteamericano Larry Robinson, para quien es un fraude por el sistema de arrojar al aire un objeto discoidal). Recientemente recibí de Patrick Ferryn una copia de segunda generación de la foto original y me apresuré a solicitar un análisis a nuestro consultor fotográfico habitual, Andrés Duarte. A continuación, su estudio de la imagen, que se explica por sí solo y que es revelador de un fraude. A veces es posible estimar la distancia y tamaño de un objeto en una foto a partir de la magnitud de su desenfoque gracias a la relación definida que existe entre enfoque y distancia. El desenfoque se puede cuantificar modelándolo y ajustando el modelo al espectro de Fourier de la imagen, o a su distribución de gradientes, o a la PSF (point-spread function) obtenida mediante restauración. El ajuste se puede hacer con técnicas de optimización o de aprendizaje. En la lista de artículos citados al respecto  se detallan algunos métodos específicos y se explican los conceptos mencionados en este párrafo. En la foto de Conejo no es fácil hacer una estimación confiable del desenfoque debido al exceso de granulación y porque la imagen está corrida además de estar desenfocada, de manera que en este caso se hizo la medición en varias copias de la foto y a través de varios métodos de estimación de desenfoque, promediando luego los distintos resultados. Para no confundir el efecto del desenfoque con el de corrimiento, la evaluación de los resultados debe hacerse en la dirección perpendicular al movimiento, donde solo hay desenfoque. En la figura se muestra la imagen original del objeto en una de las copias a la izquierda, y a la derecha la foto está parcialmente desgranulada mediante un filtro adaptativo y el enfoque está restaurado por deconvolución. La deconvolución puede usarse para restaurar completamente la nitidez de una foto, pero en este caso necesitamos restaurar el enfoque solamente para distinguir el desenfoque del efecto del corrimiento. En ambas imágenes es posible notar a simple vista que los bordes del objeto están más borrosos en la dirección del movimiento (flechas rojas) y más nítidos en la dirección perpendicular al movimiento (flechas verdes), pero esta diferencia se ve más fácilmente en la imagen restaurada, ya que en ella se ha restaurado el enfoque y no se ha corregido el corrimiento. El desenfoque medido a través de los diferentes métodos utilizados, expresado como diámetro del círculo de confusión "c" , fluctúa entre 0.18 y 0.21 mm (0.195 mm en promedio) en la imagen del árbol, y entre 0.12 y 0.15 mm (0.135 mm en promedio) en la imagen del objeto. Si el árbol estaba a unos D = 30 m de distancia, entonces podemos despejar S de la fórmula sabiendo que su imagen tiene un valor de c igual a 0.195 mm. El resultado es S = 5.9 m, y este valor no ha de tener un error importante aunque la distancia del árbol no sea muy exacta, porque la fórmula es poco sensible al error a grandes distancias. Conociendo ahora el valor de S y sabiendo que el objeto tiene un desenfoque c = 0.135 mm podemos despejar la distancia real D al objeto. En este caso tenemos dos soluciones que son D = 3.8 y 13 m, porque hay dos planos con el mismo desenfoque, uno delante y otro detrás del punto de enfoque. La razón entre el tamaño de la imagen del objeto en el film (que es de 2 mm) y la distancia focal (f = 114 mm) es igual a la razón entre el tamaño del objeto y la distancia del objeto a la cámara D, de manera que el objeto mide D*(2 mm/114 mm) = 7 o 23 cm. Es poco factible saber con certeza cuál de las dos soluciones es la correcta, pero en cualquiera de los casos, las reducidas dimensiones del objeto y la presencia de corrimiento en su imagen son consistentes con un fraude realizado con un pequeño disco lanzado al aire. El año 1954 todavía sigue arrojando casos inéditos. Desde que publiqué mi trabajo “El año 1954 en fotos (versión ampliada)” en 2008 (http://www.box.net/shared/bg8v8enkso) han aparecido varios casos nuevos, pero parece que no serán los últimos. 1954 sigue aportando casos fotográficos desconocidos, a medida que se revisan viejas colecciones de periódicos locales. Veamos algunos encontrados recientemente. Hubo un avistamiento el 9 de agosto de 1954 en la localidad canadiense de Saint John (New Brunswick). El diario Guardian of the Gulf, que se publica en Charlottetown, informó en su edición del día siguiente que un objeto volante redondo y blanco, con una marca en forma de “Y” en su cara, fue avistado desde las siete de la mañana hasta la puesta del sol. Dos fotógrafos tuvieron la fortuna de hacerle varias tomas, “mostrando al objeto de tamaño cambiante”. En mi opinión, muy probablemente se trató de un globo inflado con hidrógeno. El Dixon Evening Telegraph, un periódico editado en Illinois, llevó en su portada del 11 de mayo de 1954 unas notas del Diario del Editor informando que a las 6,15 de la mañana le había despertado la llamada del sargento Jack Van Meter para informar de un "globo sonda que parecía un platillo volante”. Esa mañana muchos ciudadanos escrutaban el cielo para ver la curiosa aparición. Más tarde, la oficina del sheriff dio un informe de un segundo globo meteorológico, que esta vez fue fotografiado: "el objeto ha quedado registrado como una mancha blanca en la película", dijo el jefe-adjunto Bob Burrs. Ahora en Bélgica: La Docherie, Marchienne-au-Pont, Hainaut, 26 de octubre de 1954. A las 4 de la tarde y durante más de 14 minutos, mucha gente se sorprendió al ver un segundo sol en el cielo, que llegó a ser filmado. La investigación puso de manifiesto que se había tratado de un parhelio, un fenómeno óptico asociado a la reflexión o refracción de la luz, debido a la existencia de gran densidad de partículas de hielo en nubes del tipo cirros. Son parecidos a los halos y se manifiestan alrededor de 22º a la izquierda o derecha del sol, como una mancha coloreada en el cielo. La información la publicó Le Journal de Charleroi del día siguiente. De vuelta a los Estados Unidos, alrededor de las 8 de la noche del 26 de septiembre, “un cilindro multicolor” se observó desde South Wayne (Wisconsin), hecho que se repitió un día después bajo el cielo sudoriental, “aparentemente bajo las otras estrellas” que siguió “flotando alrededor” al tiempo que despedía luz roja, verde, azul y amarilla a intervalos hasta que se desvaneció. Comprobamos que el planeta Venus emergía prominentemente brillante en el horizonte sudoccidental. ¿Pudo la dirección publicada deberse a una errata del diario? Uno de los primeros incidentes de caída de “cabello de ángel” y probablemente el primero en ser filmado ocurrió en el pueblo de Monee, Illinois, durante la semana del 18 al 24 de octubre de 1954, según informó el Chicago Star Publications del 26 de octubre. El denominado “cabello de ángel” (angel’s hair en la jerga ufológica) no es sino seda de araña. Cuando millones de pequeñas arañitas aéreas sueltan ese hilo en el aire, mientras vuela se mezcla con otras hebras y pronto se forma una mata volante de una sustancia blanquecina y pegajosa. Muchos aldeanos se vieron inundados por hebras algodonosas de esa sustancia, que ya ha dejado de ser misteriosa. Era sabido que el 7 de julio de 1954, muchos londinenses fueron sorprendidos por la aparición de un objeto luminoso en forma de pera que navegó a la deriva sobre la ciudad durante diez horas. Un día después se anunció que se trató de un globo para el estudio de los rayos cósmicos lanzado por la Universidad de Bristol. Finalmente logré ver una imagen de esta observación (ver la foto a continuación). Por último, comprobamos tras la lectura de numerosos recortes de prensa norteamericanos de 1954 que existió una intensa actividad de globos sonda entre septiembre y noviembre de aquel año. Procedentes unos de fuentes militares locales, del servicio meteorológico de los EEUU, el Air Force Research Center (Cambridge, Massachusetts), la base de la USAF en Vernalis (California), el Holloman Air Development Center, y otros responsables, parece evidente que los cielos de los Estados Unidos se vieron surcados por muchos de dichos objetos volantes (algunos de ellos vistos caer y recuperados), llegando a crear revuelo en la población que los avistaba y que los tomaba por platillos volantes. Resumen: La visión antropocéntrica de la humanidad le impide tener una perspectiva abierta acerca de si estamos solos o no en el universo. Los avances tecnológicos en astronomía han comenzado a eliminar la sensación de exclusividad de la Tierra. La cuestión a plantearse es la probabilidad de vida inteligente en el universo. A las 10,53Z del 8 de octubre de 1985 el cielo pareció desprenderse sobre Japón, donde eran las 7,53 de la tarde, hora local, cuando el cohete propulsor del satélite ruso Cosmos 1685 (designación internacional 1985-085B, número de catálogo 16089) descendió a la Tierra en una infernal reentrada que fue observada por innumerables ciudadanos. Todos hemos visto a los turistas japoneses, acompañados con sus inseparables cámaras fotográficas. Por ello era de esperar que el sorprendente espectáculo luminoso de esa tarde también fuera fotografiado una y otra vez desde varios puntos del país, para satisfacción de astrónomos y científicos espaciales. El cuerpo del cohete fue visto desintegrarse en una trayectoria descendente entre los 85 y 45 km de altura, con una velocidad de 6,8 km/segundo, durante varios minutos. Fue tiempo más que suficiente para que se capturara en fotografía y en video por muchos sorprendidos observadores. Uno de los más notables informes de aterrizaje ovni en Argentina es el caso de Trancas (provincia de Tucumán) del 21 de octubre de 1963. El suceso tuvo lugar entre las 9,30 y las 10,15 de la noche, cuando varios testigos presenciales de la familia Moreno, tres hermanas de 24 a 30 años, sus padres, y una criada de 15 años, vieron un objeto iluminado en forma de tren, de unos 8-10 metros de envergadura, con ojos de buey, situado a unos 250 metros de distancia de su casa y que parecía estar flotando en el aire. En el interior del objeto fueron vistas varias “personas” que se movían de un lado a otro. Del ovni se emitió un poderoso rayo de luz que cegó a los testigos. El capitán Omar Pagani, de la Marina argentina, encargado del estudio de los informes ovni, investigó el incidente. Muchos años después, Pagani tuvo la gentileza de hacerme llegar una copia del formulario oficial rellenado por la testigo principal y la correspondencia cruzada con ella. Deseo compartir esta información inédita con todos, que adjunto en forma de archivo pdf. Incluyo asimismo una fotografía de la testigo ocular Yolanda Moreno, sacada 28 después de la observación: al fondo, el supuesto lugar del aterrizaje. Este avistamiento ha sido detenidamente investigado por dos de los principales ufólogos civiles argentinos, el psicólogo social Roberto E. Banchs y el abogado Oscar Galíndez. Ambos, respetados y buenos amigos míos, mantienen posiciones contrapuestas en cuanto al origen de esta extraña manifestación (ejercicios militares para el primero y un verdadero encuentro cercano ovni para el segundo). Junto con la publicación de este formulario de la Marina argentina, quiero dar los dos opuestos informes de investigación de Banchs y Galíndez, de forma que el lector juzgue por sí mismo. Este es el resumen del trabajo: “Fenómenos transitorios anómalos se han observado sobre el valle de Hessdalen (Noruega) durante más de 200 años. La primera documentación escrita procede de 1811, cuando el cura Jakob Tode Krogh escribió sobre esto en su diario”. Pero el investigador noruego Ole Jonny Braenne disiente y afirma lo siguiente: “Esto es del todo incorrecto y Hauge & Strand deberían saberlo. El “informe” de 1811 se refiere al cometa C/1811 F1, visto en todo el mundo, no sólo desde Hessdalen. Y el sacerdote Jakob Tode Krogh ni siquiera escribió un diario. No existe tal. De forma que los autores citan una fuente que no existe. La primera referencia al respecto es el libro de Reitan, Bygdabok for Ålen escrito en 1934, página 314, donde se cita en una única frase al padre Krogh y en la siguiente frase casualmente se menciona la observación en 1811 de una estrella con grandes estelas fue vista en el cielo. Reitan aparece citado en el diario de un tal Lars Dybdalen, donde se da información de muchos sucesos sociales locales ocurridos entre los años 1806 y 1824. Alguien ha malinterpretado el contexto”. El boletín brasileño SBEDV de abril de 1968 publicó una brevísima nota de apenas 4 líneas sobre una foto tomada en Bell City (Buenos Aires) la noche del 15 de septiembre de 1967 por un ciudadano argentino de nombre Alfonso R. Paolocá. La cámara usada fue una Voigtländer de 35mm, con filtro verde y una exposición de 2-3 minutos. A primera vista, uno cree ver una luna creciente repetida varias veces, como cuando se hace manualmente una foto con exposición. El boletín recibió la foto de un aficionado argentino y si el nombre era equivocado en parte e incompleto (el nombre completo era realmente Hipólito Rodolfo Paolocá), me temo que también la fecha podría ser inexacta. Esa fase lunar creciente se vio en Buenos Aires una semana antes, el 8 de septiembre, a las 8 de la noche, así que uno está tentado de asociar el supuesto ovni con la forma que la luna adoptó aquel día. Seguidamente, la fotografía y la fase lunar. Al registrar el anterior caso en los anales FOTOCAT, éste resaltó otro de la misma localidad, Bell City, ocurrido con anterioridad. En efecto, una serie de cinco fotos se había tomado a las 9,15 de una noche clara el 22 de mayo de 1962 por nada menos que Hipólito Rodolfo Paolocá, en aquella época ufólogo y fotógrafo aficionado. ¿Sabe usted cuantos otros testigos de este avistamiento surgieron en este superpoblado barrio de Buenos Aires? Cero. Sólo él. En aquel instante, la luna era visible, saliendo desde el horizonte oriental. Y esta es, precisamente, mi mejor opción para hallar el verdadero culpable de estas imágenes. Véanse a continuación las cinco fotos y la correspondiente fase lugar. Además de investigadores con experiencia, me consta que otros, aspirantes a “ufólogo”, también leen este blog. Esta nota está especialmente dirigida a ellos. El Center Investigators Quarterly, de junio de 1977, publicado por el Center for UFO Studies (CUFOS) propuso un protocolo estándar para escribir informes de encuesta de casos ovni; se trata de un formato pulcro y claro que ayuda sin duda al investigador de campo a llevar a cabo su labor de encuesta sobre el terreno. Adjunto dicho procedimiento, aconsejando su uso como una herramienta positiva. ¿Son de fiar las estimaciones de tamaños? Una revisión del asunto de MJ12, breve pero extremadamente bien documentada, la hemos encontrado en un artículo recién publicado por el ex director de investigaciones espaciales del CUFOS, Don Schmitt. ¿Recuerda los documentos falsificados del Majestic 12? Una historia que supuso que la ufología norteamericana quedara congelada y se perdieran al menos 10 años, 1979-1989. Aunque centrado en el muy peculiar carácter de William Moore, de hecho todo se enraíza en la torturada personalidad de otro individuo, apenas un simple sargento, llamado Richard C. Doty, que trabajaba en la Air Force Office of Scientific Information (AFOSI), y estaba estacionado en la base aérea de Kirtland, en Albuquerque, Nuevo Méjico. Doty creó numerosos documentos falsos pretendiendo probar que el gobierno de los Estados Unidos había desarrollado una operación encubierta y súper-secreta con el nombre cifrado de Majestic 12, dirigida desde 1947 a la recuperación de fragmentos y de pilotos de platillos volantes. A mi juicio, mucho, si no todo, de lo que Doty propaló fue producto de su maliciosa mente enfermiza, aireado y multiplicado por las creencias o el interés de ufólogos crédulos y oportunistas. Un mito dentro de otro mito: la leyenda del Chupacabras por vez primera se examina metódicamente y desde una perspectiva seria en el libro Tracking the Chupacabra, escrito por Benjamin Radford. Como reza el subtítulo de esta obra, es una revisión de la bestia en los hechos, la ficción y el folclore. Se publicó el año 2011 por la editorial de la Universidad de Nuevo Méjico y ha recibido el aplauso de numerosos eruditos. Concretamente, Jan Harold Brunvand (autor de notable prestigio de libros sobre leyendas urbanas), resume de ésta forma el trabajo: “Metafóricamente, Radford clava una estaca en el corazón de la bestia, dando cuenta de sus propias investigaciones en una vívida prosa, libre de jerga académica pero rica en perspicacia en los campos del folclore, la biología y la psicología. Radford se entrevistó con los testigos oculares y al mismo tiempo estudió todas las descripciones publicadas sobre el Chupacabras en la cultura popular, para luego aplicar un análisis científico a esos datos. Sus conclusiones, expresadas de forma clara e incluso en clave de humor, representan la última palabra sobre este vampiro del siglo 21”. La fábula del secreto oficial ovni se desmorona una vez más. Esta vez en Italia. Un par de periodistas preguntaron ingenuamente a la Fuerza Aérea (Aeronáutica Militare): “¿Podemos tener acceso a los informes ovni clasificados?” “Naturalmente, a su disposición”, pudo ser la inesperada respuesta. La realidad es que Lao Petrilli y Vincenzo Sinapi recibieron la autorización de consultar libremente y sin restricciones toda la documentación que guarda la Fuerza Aérea italiana sobre observaciones ovni. A resultas de su investigación bibliográfica han publicado un libro con profusión de material. Hagamos un inciso para señalar que desde 1972 las fuerzas armadas en Italia comenzaron a recoger, catalogar e investigar denuncias de avistamientos de ovnis “de una forma orgánica” (sin embargo, otras agencias estatales habían mostrado interés en el fenómeno ovni ya desde 1950, preocupación que se espoleó a raíz de la oleada de 1954, muy intensa en Italia). Los autores dedican las primeras 30 páginas de su libro a detallar como el gobierno italiano se ha ocupado de gestionar la información sobre casos ovni a lo largo de los años. Quisiera agregar una nota de carácter histórico: entre 1991 y 2001, la mayoría de los informes ovni recogidos por el cuartel general de la aeronáutica italiana fueron desclasificados y facilitados al CISU, la más importante (y rabiosamente seria) organización ufológica en Italia. Amablemente invitado por Luís Manuel Pisu, el pasado 3 de abril participé en una de las reuniones mensuales del Café OVNI de Valencia, en donde departí con los asistentes al mismo, acompañado por Jaime Servera. Simpático y popular concepto éste que, sin embargo, pone de manifiesto la falta de (in)formación y los sesgos más comunes en el aficionado a los ovnis. La ciudad costera de Jávea, en Alicante, fue el entorno donde Patrick Ferryn, antiguo dirigente del SOBEPS, fundador y directivo del COBEPS y ciertamente una distinguida figura en la ufología belga, y yo decimos encontrarnos el pasado 27 de mayo, aprovechando sus vacaciones en España. Con nosotros, mi estrecho colaborador Jaime Servera. En una atmósfera relajada y amigable, hablamos de varios asuntos que nos concernían mutuamente, mi actual estudio de la casuística fotográfica en Bélgica con Wim van Utrecht, la gran oleada belga de 1989 a 1992, etc. Patrick entregó para el proyecto FOTOCAT muchas fotografías de los archivos de Julien Clerebaut (alma mater del SOBEPS), incluyendo muchos documentos soberbios, como copias de primera generación de las fotos del 16 de enero de 1958 en la isla Trindade (Brasil), del caso del humanoide de octubre de 1973 en Falkville, Alabama, y de otros casos. Esta reunión entre colegas reafirmó una cooperación ya muy estable entre las dos partes. En la foto que sigue, Ferryn (a la izquierda) y quien esto escribe. Ampliación de la tercera fotografía de la serie de la Isla de Trindade, hecha por el mismo fotógrafo y testigo Almiro Baraúna. Nuestro consultor Andrés Duarte ha advertido que esta ampliación está retocada a mano. Recientemente, y acompañado por el estudioso valenciano Jaime Servera, tuve la satisfacción de reunirme con Antonio Munáiz, actual coronel en la reserva, con quien repasamos su participación en la investigación de varios casos ovni entre 1974 y 1977, las explicaciones que posteriormente se encontraron, el sentimiento existente entonces en el ámbito castrense por los ovnis, etc. La siguiente foto ilustra nuestro grato encuentro: Coronel Antonio Munáiz (derecha) y V.J. Ballester Olmos. A finales del mes de junio, el investigador vasco Juan Carlos Victorio Uranga estuvo por Valencia de vacaciones y aprovechamos para vernos en persona, tras muchos años de estrecha y fecunda colaboración. Dedicamos una agradable reunión a revisar documentación de algunos avistamientos que tiene previsto estudiar próximamente y que, como es habitual en él, aseguro que tratará de forma impecable. En esta fotografía, Victorio Uranga (a la derecha) y Ballester Olmos. • Entrega de información sobre casos, fotografías, archivos, bibliografía, etc.